Summer does not have to be excruciating for men who love faded hairstyles with long hair on top. Everyone deserves to be stylish and comfortable. Fades are a great way to sport long hair on top in stylish ways while keeping it cool. Here are 25 ways you can rock fades with long hair on top. This one is for men with strong and thick hair. Textured designs on top bring sets in this kind of hair the best with a little help from a professional hairstylist’s work. This is how you sport spiked hair without looking like you’re coming straight out of a 2003 young adult tv movie. The fade is also great for air circulation. Tie up your long-ish hair in a slick ponytail on top and let the fade work it’s cooling magic. It is literally a “cool” hairstyle which gives you a cool yet sincere look. When a man has fades in the side and his long hair tied on top, he definitely means business. You can sport this look anywhere without raised eyebrows around, even though it is something you don’t have to be concerned about. For any guy who looks so cool with fade and long hair on top in a bun, any outfit goes nicely with him. Taper fade can be worn in many ways. If you want minimal style and huge impact, this is one of the long on top taper fade styles to try. It, however, needs strong and thick hair to hold the style. However, you might use hairspray or other products for hold if your hair is another type, but that is not a good idea for regular styling. However, if you’ve got the right kind of hair, sport it upwards with fades in the side and a strong and professionally done part. Looks great in any style. Dreadlocks go rather well with fades on sides. 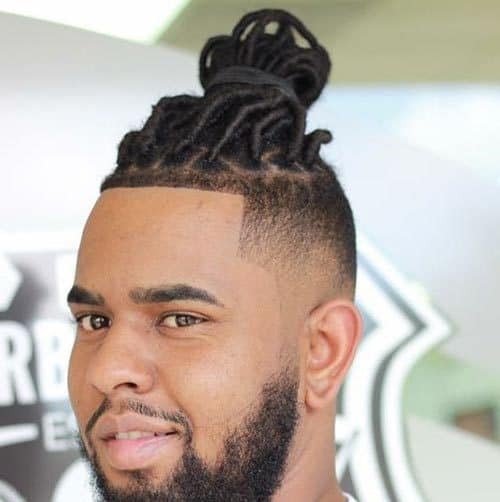 This is also the very functional style in the summer for men with long dreads on top. With fade on both sides and the dreadlocks tied in a bun on top of your head, summer days are way cooler to enjoy. Both work and workout hours are easier to deal with w/r to your hair. And also, it looks very cool! Another hairstyle selective to men with strong hair or who are okay with using regular regime of hair products. If you are not into parting your long hair on top and yet want a colossal looking hairdo, this is a good fit for you. You might need the help of your hairstylist if you have a certain length preference along with your forehead to the further side of your head. Combing upward after product use would give it a texture. 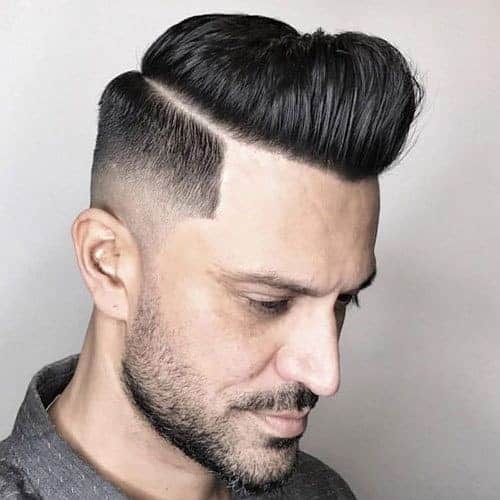 You may also like the trendy disconnected undercuts. This one is for the men with curls. Curly hair goes great with fades on side. Also, for the men with thick and curly hair, fades are a great way to look great and feel a breezy and cool during sweaty summer days. Keep your curls long on top and any intensity of fade to the sides would do you good. It’s up to you and your hairstylist to decide. Men can sport braids just good as ladies. You can wear your long mane on top in braid. This is good for summer. Especially in the gym or during a run. And having the sides trimmed in a strong fade makes the hairstyle literally and figuratively cool. You 1:0 Summer heat! “Disconnected” hairstyle is quite popular these days. The varying hair length along the top of your head is very appealing. This is a stylish and functional style. The best part, this hairstyle fits any occasion, any season or any type of outfit. Taper fade is cool, Fauxhawk is cool. Combining these two cool styles results in ultimate coolness that you can sport. Well, for you might want to have a strong and thick hair for good fauxhawk. Otherwise, the hair products are always there to hold up your fauxhawk high. Either way, you cannot look uncool even if you try in this hairstyle! This one is the mother of low maintenance fade haircuts. Let your hair grow out in any direction you want, or if you want, you can go to your hairstylist for pruning your hair is a certain way if you want it to grow out in a “planned messy” way of your desire. Either way, you don’t have to do much to “maintain” your hair. The fade in sides would keep your head cool. Subtle or smoother shadow fade is also a very trending hairstyle. If you are not sure about pursuing a fade right now, this is the best way to test if fade haircuts are for you or not. Keep the top part the way you want, however, a little unevenness or layers on top will make the style even cooler. Slick it back with some products or leave it to air-dry after the shower, you’ll have an appealing style! Keep some long strands in front with a high bald fade. This is stylish and functional hairstyle for hot summer weather. If you have piercings, this haircut will give you a special edge. It suits any face cut, but for oval faced men, it fits like a clove. High fade hairstyles can also be rocked with long hair grown in different directions. Enlist your hairstylist’s help in shaping it right and let it grow. A side part would divide the hair on top in two uneven sides, which would add more grit to the hairstyle. Curly hair does not have to be extra-long for sporting a good fade haircut. You can sport fade hairstyle with shorter hairstyles, or if your hair on top is still in growing phase. You can go softer on the fade if that’s what you prefer. As long as you are comfortable, this hairstyle works. Fades and Pompadours make a good team in cool and vibrant hairstyle race. Both elevate your chances to look cool and feel cool (literally). You will have the comfort of a fade in this summer heat and the stylishness of a pompadour as well. A part would accentuate the whole look. Whether it’s a suit or you’re tanning your torso in a beach, this hairstyle goes with everything! Low Bald fade is one of the trendiest fades. 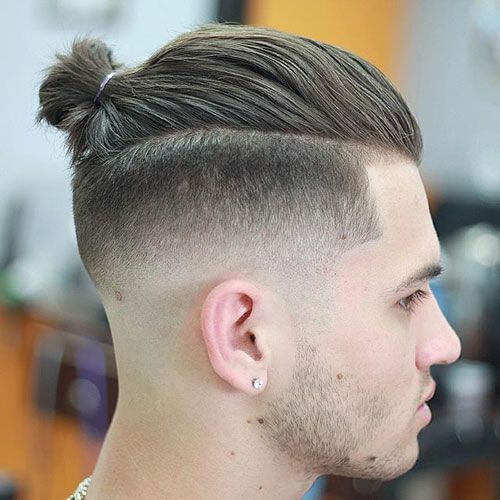 This is a stylish fade hairstyle with long on top. This one looks especially cool if you have a beard. It gives out a manly and fashionable vibe. Stylish pompadour brings out a side of your look that represents youth and class. Fades in both sides add the effect of youth and brings you comfort. A worthy combination to try if you are willing to be stylish and comfortable with fades and long hair on top. For wavy or curly hair, it’s most prominent and easiest to sport. However, you can adopt this style without having wavy hair. Textured slick back is classic style for long hair on top. And medium fade to sides adds the vibe of youth and current hairstyle trends. Moreover, if you are not sure about the current hairstyle trends, this one is a great one to try. 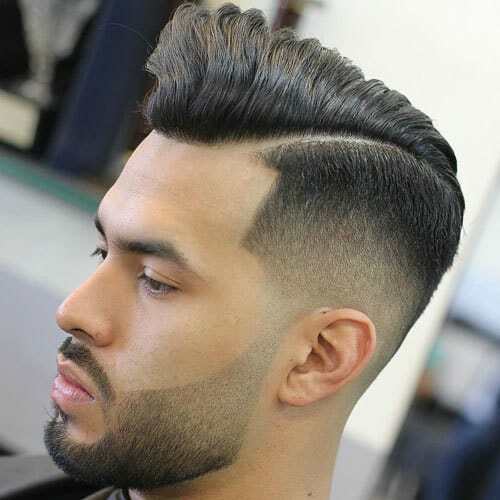 Temp fade is one of the most popular current hairstyle trends for men with long hair on top and fades on side. To add the effect of more stylishness, you can try doing a good combover on top. You can enlist the help of your hairstylist for best results. For men with thick hair, this is a cool way to capitalize your thickness of hair while sporting a stylish look. This will also bring comfort to you in summer days. The thick textured hair on top and high fade- both are very trendy nowadays. 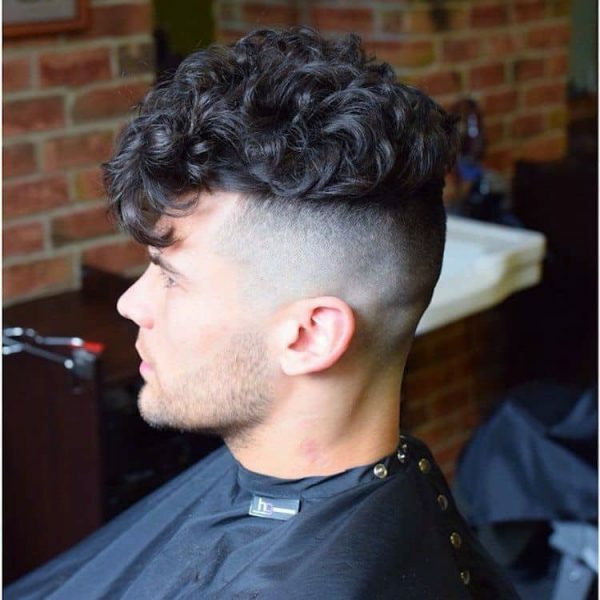 If you have long curly hair on top, this is a stylish fade hairstyle, especially for you. Wear your curly hair in cropped fringes on top. While sporting soft and low fade. If you are willing to enlist the help of a professional hairstylist, you can rock this hairstyle and give yourself a new and trendy look. High temple fade with artistic designs goes great with a stylish pompadour. 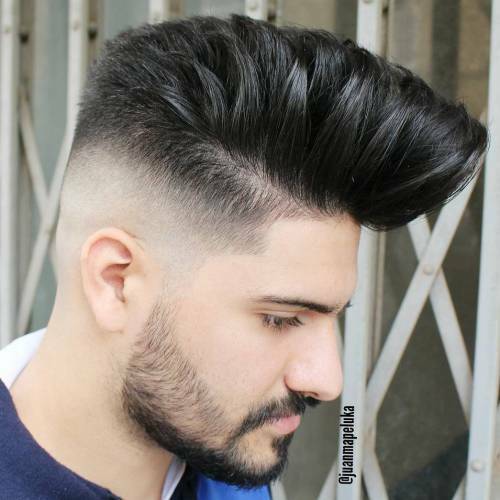 This might need some maintenance for the pompadour, but if you are okay with that, then this is a great hairstyle for men who want to rock their long hair on top with sides in fade. This one is also a very stylish and classic go-to fade-based hairstyle for men. The best part of messy quaff is, you can look trendy and at the same time, you can give the classic 80’s or 90’s vibes with your style. The best part is, this is a very low-maintenance hairstyle. If your mane is long enough for a good ponytail, you can still rock the fades to sides. This will be comfortable in the summer heat and will allow you to rock your longer mane in style. Have fades on both sides and wear the long hair on top in a ponytail. You can rock anything from a beach party to a stiff and formal presentation with it. This is the most stylish way to sport long hair with side fade so far. If you have grown out your Mohawk too long, this is going to be a great style for you. Let your Mohawk grow and trim the hair on both sides in fade. You’re all set! If you have a well-kept beard, that would be a bonus! These are just some hairstyle templates to work on. You don’t necessarily have to strictly go by these styles. Improvise with your own styles and get your fade hairstyle look. It’s all about comfort and styles after all.